Circular Brushes Industry Manufacturer │ Circular Brushes, for perfect fit! 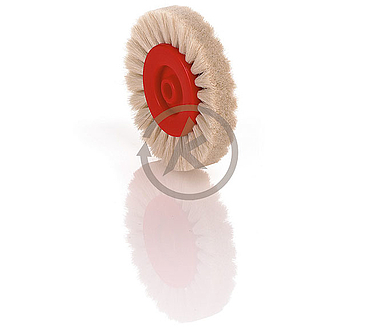 Circular brushes are defined as brushes with a body length of up to 100 mm. The comprehensive range of dimensions, core materials, fill materials and fill configurations demonstrate the versability of Kullen-Koti again and again. As a matter of course it is more economical to use our standard dimensions for the brush cores. You will get your brushes in shorter time and for a lower price. Special models, for example with special fill configurations, core forms, axial hole with feather key groove, feather key dowel hole and collet thread or ball bearing are no problem for us. In case of special brushes, we would like to ask you to send us a drawing or simply discuss your requirements with our technical consultant. The max. circumferential speed for this brush type is 15 m/sec. High fill densty EA1, normal fill density EA2, low fill density EA3. In addition to a full fill configuration in three densities, we also produce circular brushes with a spiral fill EB and linear fill ED1. We would be pleased to supply you on request with details of special designs with wood or metal cores. In the case of brushes with non-cylindrical bodies, we would ask you to send us a drawing or simply discuss your requirements with our technical consultant. Diamond grain is aggressive towards almost everything! Due to this diamond grain the AND filament has maximum aggression and a considerable lifetime. Therefore this ANDERLON quality is especially used for the treatment of hard alloy tools. A flat bristle (1.20 x 2.50 mm) and (1.14 x 2.28 mm) für that gives longer life and shorter processing time, is very stiff and contains a high percentage of abrasive grit. These flat bristles are normally used with coarse grain, eg grit 80. We recommend to have a word with our specialists to ensure you receive the best material for your application. Steel wire, tempered, extra hard and particularly tough, crimped, dia. 0.20 mm to 0.50 mm. Steel wire, tempered, hard and tough, straight, dia. 0.25 mm to 0.80 mm. Bessemer steel wire, crimped, dia. 0.06 mm to 0.25 mm. Chinese hog bristles, medium or hard, grey or black. electrically conductive, special filament (up to 5 x10 kOhm/cm2) based on polyamide, straight, black,temperature resistant up to 100 °C, dia. 0.13 mm and 0,25 mm. For large quantities the following bristle-dia. are available to special order: 0.21 mm, 0.41 mm, 0.52 mm and 0.64 mm. Extremely heat resistant (up to max. 200 °C) and chemical resistant special straight filament, colours on request, dia. 0.20 mm to 0.60 mm. Stainless steel wire, acid resistant, crimped or straight, material no. 1.4301/1.4310 or 1.4401/1.4571, dia. 0.08 mm to 1.00 mm. Special bristle based on polyamide, very good alkaline resistance also at high temperatures, straight or crimped, colours on request, dia. 0.08 mm to 1.50 mm. Brass wire (CuZn), straight or crimped, dia. 0.06 mm to 0.56 mm. Nickel-silver-wire (CuNi), crimped, dia 0.06 mm to 0.25 mm. ranks before PA 6.6 and PA 6 because of the lowest water absorption. All polyamid qualities have strong recovery properties. PA 6.6 is the filament with the highest rigidity in dry application before PA 6.12 and PA 6. In case of wet use PA 6.12 ranks before PA 6.6 and PA 6 because of the lowest water absorption. request, dia. 0.15 mm to 1.00 mm. Polyester, straight or crimped, colours on request, dia. 0.20 mm to 3.00 mm. Polyethylene, straight or in x-cross-section, either flagged or normal, colours on request, dia. 0.80 mm to 1.00 mm. Phosphor-bronze-wire (CuSn), straight or crimped, dia. 0.05 mm to 0.50 mm. Special wire, corrosion-proof, resistant against process steam up to 650 °C, straight or crimped, dia. 0.30 mm to 0.50 mm. Steel wire, natural hard, extra hard, crimped, dia. 0.12 mm to 0,25 mm. Steel wire, natural hard, crimped, dia. 0.06 mm to 0.80 mm. steel wire, tempered, straight, dia. 0.30 mm to 1.20 mm. Special wire, highly heat resistant up to 1350 °C, crimped, dia. 0.30 mm to 0.50 mm. Goat hair, extremely soft, is known as a so-called ”fine hair“. KULLEN principally uses only firstclass quality. High compressed fill for even treatment of surfaces. Medium compressed fill for even treatment of surfaces. Low density of fill for even surface treatment. The advantage of configuration EB 1 to EB 3 and EC 2 to ED 1 is the fact that the brush surface will not be clogged with the material to be removed.